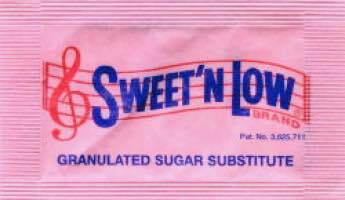 Artificial sweetener side effects include glucose intolerance and DM. Artificial sweetener side effects include glucose intolerance and diabetes; this is not opinion but scientific research. The only difficulty is that the sample size was small and it needs to be repeated on a much larger group of people. White mice were fed on a diet that included a syrup of saccharin at the same maximum concentration allowed for humans, for three months; that's not uncommon and many folk have been on it for years. The control group was given a similar sugar syrup in their diet. Then both groups were given a very sweet meal. The saccharin lot showed an abnormally high spike in blood sugar as compared to the control; that's a sure sign of glucose intolerance. This research was done at the Weizmann Institute of Science and was published in the journal Nature. Saccharin was then given to a small group of human volunteers, at the maximum allowed dose; within a week, over half of them were showing signs of glucose intolerance. What the researchers also found was that the saccharin changed the normal flora in the colon; when these microbes were taken from the faeces of the artificial sweetener group and given to normal healthy mice, they too began to show signs of glucose intolerance. The so called flora in our bowels are very important; taking chemicals, and even antibiotics that destroy the balance, giving pathogens the chance to proliferate has a seriously detrimental effect. The bugs in our intestines play a vital role in our health; anything that messes with the normal flora will affect us adversely. Artificial sweetener side effects is reluctant to endorse any added chemicals to the diet. Whilst better public health such as the control of water borne diseases has emphatically improved the human lot, there's no denying that we have in the last century seen a massive surge in cancer and autoimmune disease. Many reasons have been tabled, but the chemicals we are exposed to in the environment, and in our food is certainly one of the major causes. Saccharin is just one of these chemicals. It was first discovered nearly 150 years ago with a sweetness hundreds of times greater than that of sugar. First it was used by Coca Cola more than a century ago and then in 1958 as Sweet and Low as an alternative to cane sugar in our tea and coffee. Sadly there was a downside; saccharine causes bladder cancer in rats. It is still banned in many countries but big business has enabled the continued production in the United States despite the serious dangers to our health. Why should this be an issue at chiropractic help? Many of our patients suffer from obesity which has a such a deleterious influence on the joints as well as the organs. Advice on weight loss is an every day affair at the coalface. The side effects of artificial sweeteners is an important issue. Perhaps more disturbing was the fact that their research found a close correlation between the use of saccharine and not only adverse glucose metabolism but also actual weight gain. Could one of the artificial sweetener side effects actually be an increase in obesity? That's bizarre. In short, the use of chemicals in our food should be considered with the greatest discretion. The struggle to better health is something we all face; not only because of the threat of early demise, but due to the pain and disability that obesity and all the auto immune diseases cause. Consider just the pain and swelling of the swollen joints of rheumatoid arthritis, or the connective tissue disease associated with lupus. We should be dubious about any foods that have flavouring, preservative chemicals and artificial sweetener side effects. It means getting back to growing our own organic foods, doing our best to finding the source of our vegetables, meat and eggs, for example. Yes, it's difficult, but in the light of the horrific diseases that have proliferated in the last century, it's worth the time and energy; in my opinion at any rate. We find ourselves between the Devil and the Deep Blue Sea, and it's my choice to become something of a food snob rather than suffer swimming in an ocean of chemical discontent. Remembering that the threat of a serious disease known as health food neurosis lurks in the wings. The upside is that we take no chronic medication whatsoever; in fact neither the good wife or either have swallowed any pills for probably over two years; that alone justifies the serious effect we make to avoid chemicals and to focus our diet on the finding of this heart stroke diabetes research group published in the Journal of the Medical Association. "Nothing kills as effectively as high blood pressure; it's the single biggest contributor to the global burden of disease and death." Researchers followed 66,118 French women who drank artificially and sugar sweetened beverages for 14 years. Sugar alcohols are sweeteners that are found naturally in plants; examples are sorbitol, xylitol, maltitol, isomalt and hydrogenated starch hydrolysates. They are found in many fruits and berries, the fibre of many vegetables, and beer and wine. They have about half the calories of sugars and others starches. They are not the same as artificial sweeteners like saccharin, aspartame and sucralose which are entirely synthetic, but have zero calories; these are the ones that are particularly unsafe. Stevia lies somewhere between. It is 'natural' in the sense that it is plant based. However it is highly processed; a compound called a glycoside is extracted from the Stevia plant and then dehydrated and purified in a laboratory. The FDA has admittedly given it the 'generally recognised as safe' status. Most of us have a sweet tooth periodically; the alternatives are sugar, processed honey and raw honey, and artificial sweetener side effects. You pay your money and take your choice. What also must come into the equation is a mental illness associated with supposed healthy living that some exhibit. It's known as orthorexia; are we beginning to display the symptoms of health nut neurosis? Or is it just that we don't want to be sickly and practise prevention rather than be faced with the horrific side effects of cancer treatment, or diabetes, not to mention the cost? It's a fine line, and putting our heads in the sand, ostrich like, will not do. Unprocessed raw honey is my choice of sweetener. Surprisingly it doesn't have a high glycemic index in part because of the protein and fat in the hugely beneficial pollen when only lightly filtered. The stuff you buy in the supermarket generally is highly processed and of questionable value. Look for a small beekeeper whom you can trust and who's honey has the pollen from your own neighbourhood; it's the only solution. Honey keeps indefinitely so buying a year's worth at harvest time is the way to go. Expect to pay more for a premium product, though oddly it takes less work and energy than the highly processed stuff. The Banting diet modified is the better way of going about losing weight without exposing you to increased risk of other diseases; it enables you to avoid the artificial sweetener side effects. Folk are desperate to lose weight; they'll try anything, notwithstanding that only 5 percent have actually lost their obesity one year later; in fact many are actually heavier. That's one of the problems with saccharine; it actually contributes to the disease. Let your food be your medicine was the advice of the famous sage Hippocrates; he's the father of medicine and chiropractic, and was a very wise man. The Banting diet has much going for it; it is effective. You will lose weight, and not feel famished, but you have an increased risk of cancer and heart disease; that's a heavy price. Instead of using dangerous dripping from bacon rather use olives and avocado fat. Our apple salad recipe does have some carb in it but it's the healthy stuff, and not at all the same as white bread or rice which are very highly glycemic. Rather we are promoting the modified Banting diet (see below) if you insist on slavishly following some diet; rather we would recommend you grasp the meaning of glycemic index and follow its dictates; they're not onerous. Chiropractic help is a website dedicated to enabling you to improve your health the safe way; informing you about issues such as artificial sweetener side effects. Obesity is a huge problem in our chiropractic clinics with our patients overloading their joints and thus wearing out the hyaline cartilage that line the ends of the long bones in the lower limb. The real issue at the heart of this is that we are always looking for the easy solution to a knotty problem. Taking blood pressure pills instead of stopping smoking; injecting with insulin instead of losing the pounds and endangering our health with artificial sweetener side effects instead of taming our sweet tongues. Raw honey in moderation is okay, but even that should not be over the top; recently we had an obese guest who thought four teaspoons in her tea instead of sugar was the healthy thing to do. Backyard permaculture is the complex subject of caring for nature, and we have found that it has cared for us. This philosophy of life has become bedrock for us.